I'm genuinely perplexed but also am deeply flattered when I read comments requesting to see my outfits. I think I hear more about the lack of them though...... It was only 1.5 years ago when I reluctantly showed my face on the blog for the first time. I know how hard it is to relate to the writer behind the blog when there isn't a face attached. It was never my intention to turn this into a personal style blog but like many others, I secretly have voyeuristic tendencies and enjoy seeing other people's outfits and closets. It is incredibly daunting to turn up to events where most attendees are in their 20s/ early 30s, beautifully made up, skinny and tall with nary a wrinkle in sight whereas I was dressed for comfort. Thanks to the blog, I sit on the fringe of the fashion industry where most of the time, you're judged on your appearance and what-can-you-do-for-me type of attitude (it's all about "I'm only interested in knowing you if you're pretty or have the social media to promote me/products"). Never mind that I had to make a mad dash from the train station, worrying that I was going to be late to do the school run later and numerous after school activities, meeting my deadlines, dinner, homework...... Brushing my hair or remembering to reapply my lippy is the farthest thing from my mind. 1. I hardly ever think about what I should wear because it makes me anxious. When I do, my brain turns to mush and then I try to forget about it which makes me even more stressed because I still don't know what I should wear. 2. I hate posing. Notice that I only know how to bare my teeth in a semi grin/sneer and stand like stickman. Even Lil L has taken to rolling her eyes at my shoddy attempt at modeling. 3. I only ever remember to take a quick photo AFTER I'd eaten a full meal and most of my make up have been wiped/rubbed off. 4. I wear the same pieces over and over and over and over and over and over again. I think you're getting my point here. 5. I love my sweatpants and sweatshirts. A. LOT. Yeah.....you know that too. 6. I'm pretty sure my mom, her friends and relatives are still reading my blog.......yikes!. 7. I hate having my photos taken. Detest. Loathe. Running out of adjectives here but you know what I mean. 8. 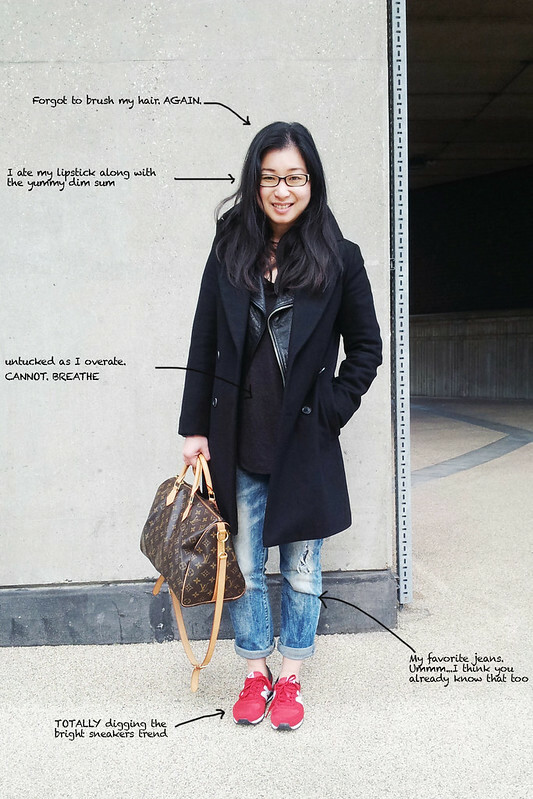 There are way too many personal style bloggers who seem to have a knack for putting outfits together. You don't need another. 9. I don't do trends. My brain's running on an old Intel chip and trends move too fast to be processed coherently. The only one I'm digging right now is wearing sneakers with everything. address in the comment box, then make sure you check the results after the 9th March. I love looking at you - you OOZE style and I am so jealous you don't have to rely upon a selfie pose! It's all about using the right bribe to get our minions (aka kids) to work for us. You have my dream hair, mine is so thin and fine without masses of work and hairspray. It's only now that my hair has sort of come right. It took a while for it to grow back again. All the reasons you list are exactly why I enjoy your outfit posts - they are real and relatable. I love your outfit posts, you always look so laid back and cool and not try-hard!! I hear you.. but all those reasons are what make you accessible. We identify with you. Re; #7. I totally understand. I abhor taking a picture of myself. Selfies are something inconceivable for me. Personally I love how you pull off casual chic. You make me want to rock red sneakers. And I didn't brush my hair today either until my 2 year old did it for me! I like my outfits real which is why I like your outfit posts. Cool but real. I love your honesty and that's why you are one of my favourite bloggers. hence why i love reading your blog. Ladies, thank you for your support. I'm pleased to know that not everyone brushes their hair everyday (whew!) nor do we all look perfectly polished from head to toe. It's great to know that I'm in good company! Echoing all the others: real every time. And waving at the Zara coat , totally brilliant buy and I'm afraid all my [more] expensive coats are taking a break cos this one is COOL . You know what I don't go for is a 'done' look , as I don't like to try too hard and love spontaneity plus edginess . Those sneakers are great , mine are black with electric blue N and I like the look with smart casual , a lot .